A lot happens in China in 12 months, the period of time since your Wood Matters editor was last in China. We know that the GDP growth rate has slowed to under 7%, the share market has dramatically come off its highs and the housing market has recovered strongly. A recent report had Beijing's house prices up 30% in the past 12 months! 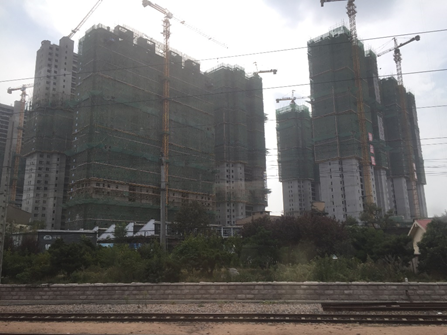 As we travelled through China we observed the usual massive investment in infrastructure (airports, high-speed trains, motorways) and the frequent clusters of cranes towering above hollow concrete apartments in various stages of completion. Apartments-in-construction still tower over much of the skyline of the larger Chinese cities. Sentiment from the business we visited was mixed. In general, the government-owned businesses were more upbeat. Massive investment in port capacity and more wood processing was evident in both the private and government sectors. This augers well for lower port costs (increased competition) - we were told that one newly opened port was offering free wharfage to attract log customers. It also augers well for demand for NZ Radiata pine from sawmillers and other wood processors. This demand, however, will only be sustainable if backed by sufficient increases in demand for wood products from end-use consumers (either domestically or for export). There is still massive investment going into wood processing in China. 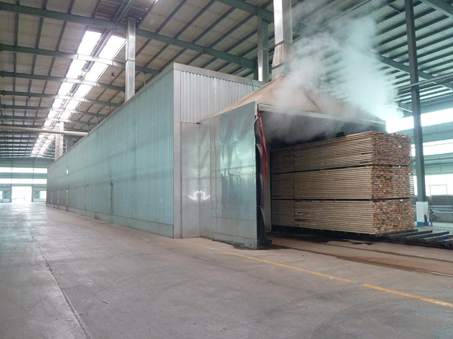 This vast integrated wood processing site had a modern continuous kiln and a modern, high-speed sawmill. At completion, the site will have 18 mega-warehouses totalling a floor area of 48 hectares. The main concern we had with hearing of capacity expansion plans was their unbelievable scale. If all of the expansion plans we heard about came to fruition, we got the impression that the wood market in China would have to double in the next few years to keep up. The proponents of these projects seemed to pay no heed to possible over-capacity issues, let alone a possible drop in demand from say, the bursting of the property bubble. Unbridled optimism seems to drive much investment and we believe it is based on an uninterrupted continuation of the current mass urbanisation of rural Chinese. A government official told us that the government’s five year plan has 260 million people moving from the countryside to cities – that’s a lot of apartment construction, fit-out and furnishing. Whilst the Chinese real estate market has picked up (and in some cities is soaring - i.e. Beijing) the sentiment amongst those exposed to the construction materials (lumber and plywood) market was subdued. We were told that many Chinese log buyers were currently losing money, especially those dealing with construction lumber. Those taking large volumes of pruned were also facing financial difficulty even with the lower pruned log prices. Three other new themes emerged on this trip, the first two were pleasing although with the inevitable feeling of "finally". The second was an increased emphasis on health and safety. At one lunch we attended, senior managers from a government-owned port company were debating the risks of workers having long shifts with few breaks. In general there seemed to be more attention being paid to things like personal protection and equipment (PPE) and safer working practices. This is a welcome development. The third theme, and a less positive one, was financial stress and issues with debt. It became clear to us that whilst Chinese households may have enviable savings habits, there is plenty of debt floating around Chinese wood products businesses. We were told of instances of banks making early calls on principal on large loans. We were told of sawmillers seeking financial assistance from government-owned businesses in exchange for preferred supplier status. It was hard to know what the drivers were here, but it is likely that the banks (all of which are government-owned) are having increased state scrutiny on their loan books. It could also be that they are being made to reduce loan exposure generally. This tightening of credit, along with escalating wage and compliance costs could jeopardise the financial viability of some Chinese forest products businesses. There are clearly some bright spots in the market. 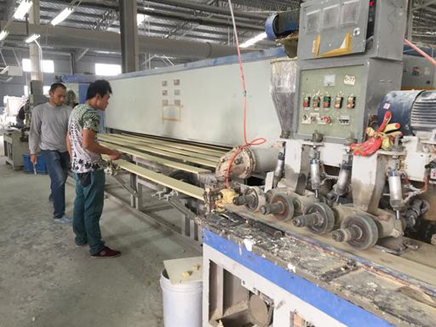 Two popular products we observed were UVP flooring on particle board/OSB (orientated strand board), and painted lineal mouldings destined for the house construction and DIY market in the USA. 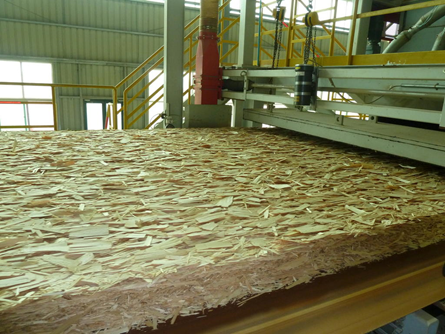 Luli Group in Shandong is making OSB from a Dieffenbacher continuous press, demonstrating that Chinese wood processing is mechanising and implementing technological innovation. 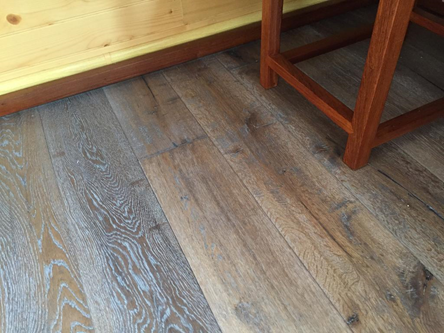 A major use of OSB is as a substrate for flooring. A very realistic image of wood grain is commonly embossed on the OSB using a hard vinyl material which is both visually attractive and hard wearing. You can see this product in use in shops, restaurants and hotels all over China. Painted finger-jointed mouldings are having the first of 3-4 coats of paint applied prior to being packaged up for the USA house construction/remodelling market. We noted that the erstwhile market darling edge-glued panels (EGP) seemed less in favour due to a big increase in Chinese supply from recent massive investment in manufacturing capacity. However, the strong USA and Chinese housing markets seem to be more or less keeping pace but margins are probably being trimmed. We observed Radiata pine lumber being imported from Chile and were told this is increasing. This, along with Russian and European lumber is a supply source threatening NZ Radiata pine’s market position. 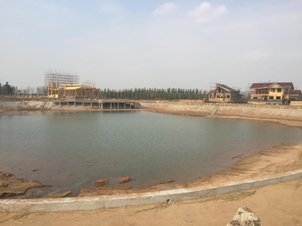 One highlight of the trip was a return visit to the Linyi Development Planning City Morning Ecological Demonstration Garden of Agricultural Science and Technology and Conceptual Planning (whew! – Chinese like big names) - we call it the “Holiday Park” for short. This 20 hectare development was only a few months into construction when we visited it in October 2015 but was fully completed and operating when we visited again in October 2016. 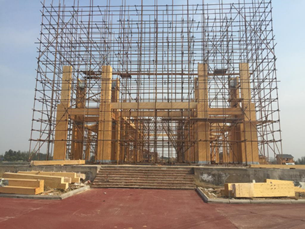 The following are some “before” and “after” photos which demonstrate just how quickly work is completed in China. In this instance its pleasing that there is a strong environmental theme to the development – and a lot of wood use! 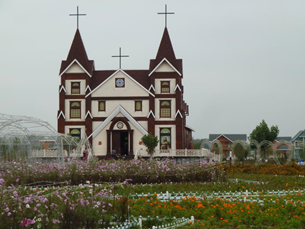 It’s welcome to see a wooden church being constructed in China and in this case, very rapidly. Only 12 months passed between these two photographs. We were told a wedding had already been held in the church. 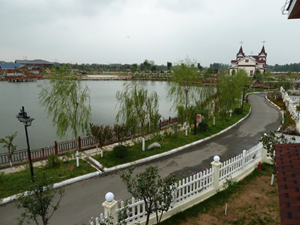 Consistent with the ecological theme of the park was a lake, stocked with fish and careful landscaping. People were observed catching fish as we walked around. Continued urbanisation and strong economic growth has the potential to drive significant increased demand for wood products for the next 20-30 years in China - far more than the increased supply from countries such as New Zealand. Whilst there are viable substitutes, New Zealand Radiata pine is well-positioned to satisfy this demand and is more likely to gain market share than lose it. It has the unique advantage of being very good (but not great) for a wide range of end-use applications. Sometimes described as the world’s best second-best timber, Radiata pine’s versatility serves it very well in the Chinese market as we witness a transition from it being used primarily for construction support to being used in a wide range of apartment fit-out, wood remanufacturing applications and furniture end-uses. Fortunately these latter two wood use segments open up more export opportunities and reduce reliance on domestic Chinese demand. What could derail the above trend is either a property market crash or “hard [economic] landing” in China and/or some other event that triggers a large and sudden readjustment in the leveraging (borrowing) and the financial markets. It could also be triggered by social unrest and now an increased likelihood of a [Trump induced] trade war with the USA. A major slow down in the economic growth rate in China (for whatever reason) would likely precipitate many of the above in any case. During the past six years, the PF Olsen log price index has increased by about 1.5% real (over and above the rate of inflation). That rate of increase is actually quite considerable as it adds about $10/m3 to the current average log price in 5 years which adds 22% to a net return (or stumpage) of $45/m3. This, of course is on top of the approximate 40% increase in net return (or stumpage) expected from a mature forest from growth of the forest during the same period (excluding the time value of money). Balancing these complex views of the future are what owners of mature and near-mature forests need to deliberate over in regards to how and when to sell their forest. Fortunately there is more information available than can be shared in this short article, and there are clever ways of analysing the actual economic growth potential of each individual forest. Should you wish to learn more about options related to your mature forest, email Peter on peter.weblin@pfolsen.com.